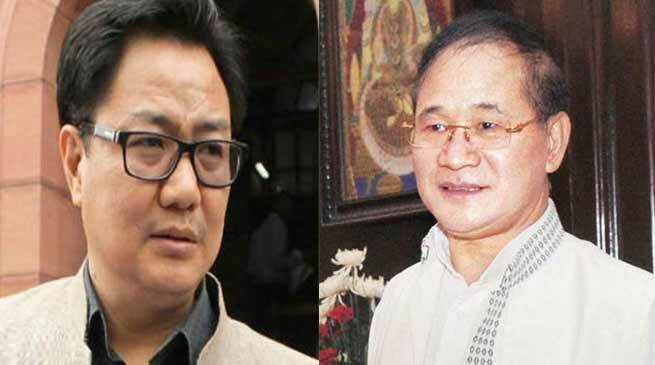 For the two Lok Sabha seats in Arunachal Pradesh, elections are to be held on April 11, but before that in Arunachal West Lok Sabha seat a controversy has arisen. The cause of the controversy is a prayer note issued by the Arunachal Pradesh Catholic Association ( APCA ) in favour of INC candidate Nabam Tuki. In the Prayer note, the church has appealed the voters to give their vote in favour of Nabam Tuki. Tuki is fighting both lok sabha and vidhan sabha election from Arunachal west lok sabha seat and Sagalee Assembly seats respectively. The BJP candidate from Arunachal West Lok Sabha seat is Union Mos Kiren Rijiju. Rijiju has placde this Prayer Note in his timeline and expressed unhappiness with. After this prayer note has gone viral on social media, Election Commission has also come into action and has issued a show-cause notice to the APCA . update: meanwhile APCA general secretary Pekhi Nabam apologise the election commission and withdrawn the prayer note. in his letter to CEO Nabam said that ” our intention was to do campaign in favour of INC Candidate Nabam Tuki “. The CEO while taking reference to Section 123 (3) of Representation of the People Act 1951 has stated that appealing for votes in the name of religion falls under corrupt practices. He requested all to refrain from making such appeal for votes in the name of religion thereby putting in undue influence and pressure on the voters which not only violates model code of conduct but is also an offence under Indian Penal Code.